Galaxy in Naperville will host the Yu-Gi-Oh Sneak Peek - Judgement of the Light, on Saturday, 8/3/13, starting at 10 am. 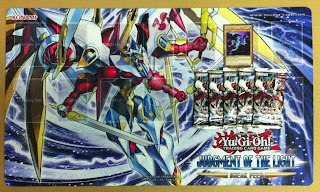 For $20, you get 5 booster packs and one super rare limited edition promo card - Galaxy Serpent. Free raffle of the newest playmats. Quantity is very limited. First come, first serve! !